The Setup fee is charged to you once. It represents the activation cost for your number. 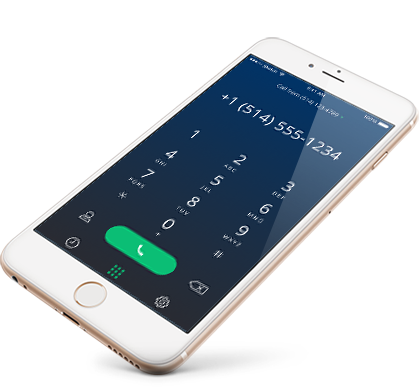 The Monthly fee is the recurring fee you pay each month to keep using your number. The Per-minute fee is for incoming and outgoing calls. The price may vary outside of United States and Canada. *$ 0,025 / min for toll-free numbers. Set a distinct professional voicemail and get your messages in your emails. You can also activate the call filtering, which will ask callers to identify themselves. You can then choose to accept each call or to send them directly to your voicemail. The Automated Call Processing service allows you to set up a voice menu and direct your customers to the right person according to your work schedule. This monthly fee allows to send and receive unlimited text messages by the mobile application Ubigo. Please note that the MMS protocol is not supported yet. ONLY AVAILABLE IN NORTH AMERICA. This monthly fee allows you to record all of your conversations (incoming and outgoing) and archives them for a period of 30 days. You can then recover, listen to and download your conversations from the Ubigo portal.